Yorkshire punk duo CHAMBERS are unveiling their new single exclusively with Vive Le Rock! ‘Down The Rabbit Hole’ follows on from the pair’s previous singles ‘Hostile’ and ‘Sister Doom’ and is released through I’m Not From London Records this Friday 4 August. The video was directed by Patrick Mateer and Josh Moore. 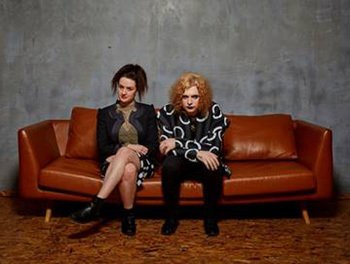 Recently winning funding from the PRS Foundation’s Open Music Fund enabling them to concentrate their resources on further recording and touring, the pair – who hail from Leeds and Hull – have already shared stages with the likes of Black Honey, Dinosaur Pile-Up, Clean Cut Kid and Louise Distras. Chambers head into the studio later this year to work on a full EP. In the meantime they’ve got a bunch of festivals and gigs lined up. Full dates so far are…. ‹ THE N.J.E. UNVEIL NEW SINGLE!